Timothy Snyder opens a new path in the understanding of modern nationalism and twentieth-century socialism by presenting the often overlooked life of Kazimierz Kelles-Krauz, an important Polish thinker at the beginning of the twentieth century. 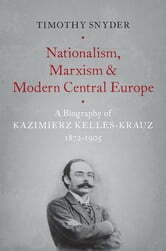 During his brief life in Poland, Paris, and Vienna, Kelles-Krauz influenced or infuriated most of the leaders of the various socialist movements of Central Europe and France. His central ideas ultimately were not accepted by the socialist mainstream at the time of his death. However, a century later, we see that they anticipated late twentieth-century understanding on the importance of nationalism as a social force and the parameters of socialism in political theory and praxis. Kelles-Krauz was one of the only theoreticians of his age to advocate Jewish national rights as being equivalent to, for example, Polish national rights, and he correctly saw the struggle for national sovereignty as being central to future events in Europe. This was the first major monograph in English devoted to Kelles-Krauz, and it includes maps and personal photographs of Kelles-Krauz, his colleagues, and his family.